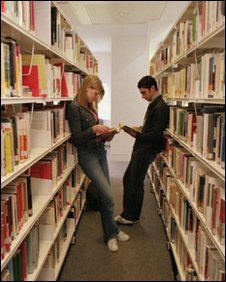 Libraries and universities are protesting about plans to make them police users of wireless networks. The government's Digital Economy Bill includes plans to make them responsible for what is done over free wi-fi. The plans imply that libraries, universities and cafes offering free wireless will be responsible if people use it to pirate movies and music. Bodies representing universities want the law clarified so they are not hit with big bills for policing every user. "We're very concerned about this," said Toby Bainton, secretary of the Society of College, National and University Libraries (Sconul). "We have been pressing them on this for quite some time." Some fear that the provisions in the Bill will also spell the end for the free wi-fi services that many coffee shops and restaurants offer to patrons. Mr Bainton said Sconul, which represents university and national libraries, wanted clarification on the responsibilities that the Digital Economy Bill introduces for its members. The Digital Economy Bill contains many changes to existing laws governing use of the net and is currently being debated in Parliament. One of the most divisive elements is the so-called "three strikes rule" that would give regulator Ofcom new powers to disconnect or slow down the connections of persistent net pirates. In a public document explaining the new changes, the government has said it will not exempt universities and libraries from ensuring that the networks they use are not used to infringe copyright. "...this would in effect give carte blanche to infringement and would attract infringers to exploit these spaces," wrote Lord Young in a cover letter accompanying the document. The confusion arose, said Mr Bainton, because the government had yet to decide whether Sconul members were to be regarded as subscribers or network suppliers. As subscribers the burden of policing would not fall on them. Instead, it would fall on their network supplier. However, said Mr Bainton, dubbing them subscribers did not solve all problems because the UK's higher education institutions got their net access from one source - the Joint Academic Network (Janet). "Janet has codes of practice about acceptable use and individual universities are very good at spotting and stopping illegal downloads," he said. "The way it usually works is that it does not get as far as infringement," said Mr Bainton. "Our house is quite well in order." The technical measures the government had proposed to help Janet police users were not applicable to a network that used massive amounts of bandwidth and employed peer-to-peer technology for legitimate research purposes, he added. Mr Bainton said university and national library networks could be "spared" the burden of oversight in the code of practice covering wi-fi that will be drawn up once the Digital Economy Bill has been passed. This is likely to contain thresholds beyond which responsibilities for policing infringement over wi-fi should come into force. The thresholds could be set quite high for academic institutions, said Mr Bainton. Despite this, he said, national and university libraries wanted clarification of their status sorted out while the bill was being debated. "We are still working on them," he said.